Ignorance, they say, is bliss. There are certain times it’s better not to know some things. For instance, yesterday two men were working to clear out the weed-clogged field next door so that it could be planted with corn. They worked for about six hours and during that time they killed two small fer de lance snakes. 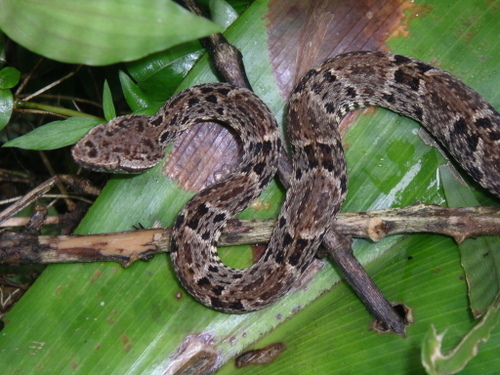 The fer de lance is one of the most poisonous snakes in the world. If there were two next door you can be sure there are a lot more around. Sometimes there are things I’d just rather not know about. There’s no need to beware of them. It’s no secret that I love my neighbors here in Boquerón, and I feel their love in return. They’re always bringing me things to eat. I’ve had some fantastic homemade tamales that can’t be beat. During mango season I was deluged with the things, and there was a bumper crop this year. Nearly every day when the avocados were in season one or another of my neighbors would bring me some. I got guacamoled out. Recently I wrote about the pibá. Today I was given a large “pipa” (pea pah). That’s a young coconut filled with delicious, refreshing and healthy coconut water. It’s at least 60 feet tall. (I measured it by visualizing the 65′ Hatteras I used to run in New Orleans standing on end against the tree) From time to time while sitting out on the front porch puffing one of my stogies I hear a loud thump as one of the nuts falls to the ground. Yesterday my neighbor brought me one. It was filled with enough water to fill a large glass. The water is not only refreshing, but it’s loaded with potassium and antioxidants. With the water transferred to the glass my neighbor cut the nut open reveling the soft, sweet “pudding” inside. According to Wikipedia, unless the coconut has been damaged the water is sterile and it has been used as an intravenous hydration fluid in some developing countries where medical saline was unavailable. While Boquete is touted by many publications as one of the best places outside of the U.S. in which to retire, I try to avoid what many of the locals call “Gringolandia” and which I refer to as the “Gringo Ghetto” preferring to live among the natives, like a native. Living as I do certainly has its advantages. I can’t imagine the gringos in Boquete receiving the treats I get from the locals, though I may be wrong in some instances. It’s been a while since I’ve written anything here. Lots of bloggers post every day. I did when I first started this project several years ago. Others post every other day, and some, like my cyber-friend Linda at http://shoreacres.wordpress.com/ who writes finely-crafted posts and puts up one a week. Me? Well, none of my posts are finely-crafted. They’re essentially first drafts, quickly written and carelessly checked for misspellings. I post them when I feel like it. Recently I’ve been negligent about posting anything. There are several reasons. 1) Life gets in the way and other things that take precedence. 2) Nothing noteworthy has been going on and 3) Sometimes I just don’t feel like it. Number 3 has been my excuse lately. It’s not like I’ve been comatose since the last post, so I’ll give you a few updates over the next couple of days. As my regulars know, I bought myself a motorcycle for my 70th birthday. As luck would have it I threw out my back a week after I got the bike. I was in severe pain for the first week afterwards. In so much pain I was THIS close to going to see a doctor. But it’s getting better now and I only get a twinge every now and then. But another problem came up. I found out that my Panamanian driver’s license isn’t good for motorcycles and if I get caught riding without an endorsement I’m going to get a ticket. What are the odds of getting caught? Excellent. There are traffic cops all over the place daily setting up road blocks everywhere and checking people’s licenses. I went to the license bureau last week to see what I need to do to get the endorsement. It was pretty discouraging. It seems that I have to go to a driving school which will cost me a couple of hundred bucks. Then I have to take a written test (in Spanish) and pass a practical test. Then I have to go through the whole licensing rigamarole all over again…photo, eye test, hearing test, another $40 fee. The worst part is that now that I’ve turned 70 I have to go to a gerontologist or an internist and get a letter saying that I’m physically and mentally fit to drive a motorcycle. I could probably pass the physical part okay, but isn’t there something suspect about a septuagenarian’s mental health if they have gone and bought a motorcycle? Comments Off on Why No Posts Lately?